Wisdom of Life. : How punctual are you? Talking about punctuality, are you a punctual person! Well! How late is considered as late for an appointment made? To some, one minute is already considered as late, whereas five, ten or half an hour might not be late for you, as long as you arrive for the appointment. Right? Not me! I am very particular in timing. I try to be earlier in all my meetings and dates. If i am late even for one second, i feel so guilty for the late arrival. No words or explanation could forgive the late coming coz it reflects on my commitment towards meeting those friends. 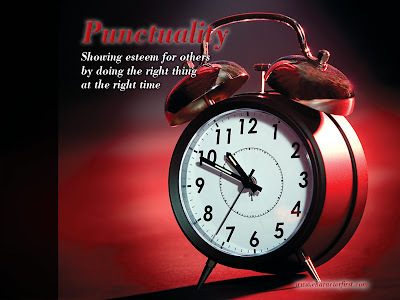 A punctual person has right attitude, and those who have right attitude are responsible people. I can't imagine those who are late but call to tell they are few minutes away and to arrive only one to two hours later. Upon reaching they are the least be bothered how others feel toward them, and at the same time they are not shameful and guilty of being late either. To them is, as long as we came, being late isn't the issue anymore. Be careful with such people because they are the most irresponsible human being on earth. For the lovers... if the man is late, throw him away but if the lady is late, she is only trying to test the man's patience. Thanks God! I was never late on all my love dates. The other day, the Angels were all away and leaving only the devils within us. That was when the devils broke loose and played fire on both of us. Thanks God! The Angels are back and they brought calm and peace again. Yes! That special person called and my heart felt good and nice. im so impressed the way you speak out your problem..its hard to see people nowadays who takes most of the matters in a good perspective.. im gaining so much of knowledge from you. You know we are giving energy to each other all the time. U read my blog to get the knowledge, and you inspire me with your sincere comments. No one could live alone to be successful. Thanks God for this wonderful reader Renuka to pep me up all the time.